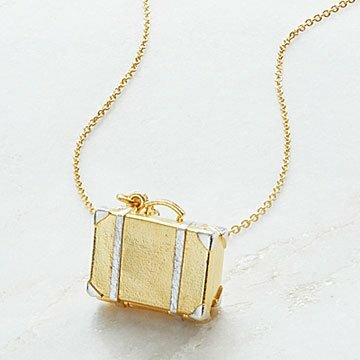 This sweet valise pendant opens to reveal a space for a snapshot or tiny keepsake from your travels. Hold mini-souvenirs or a love note for your favorite jetsetter in this sweet valise that snaps shut for safe keeping. This gold-plated suitcase features rhodium detailing and working hinges that allow it to keep a tiny memento or snapshot of someone special back home inside. Handcrafted by Alex Monroe in London. I had a problem but Uncommon Goods was great!